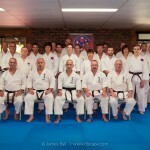 The Gold Coast branch of the Okinawa Goju Ryu Kenkyukai is run by Damien Martin (6th dan) and Hannah Thornton (5th dan) at the Southern Cross Martial Arts Centre. 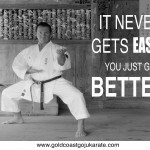 This Gold Coast Okinawan Goju Ryu Karate dojo is located on the North end of the Gold Coast, at Helensvale, in a spacious, clean and modern training facility. The Okinawa Goju Ryu Kenkyukai is headed by Masaji Taira sensei, Hanshi, 9th dan. Damien and Hannah and a number of students travel to Okinawa annually to train with Taira sensei. 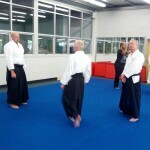 The Okinawa Goju Ryu Kenkyukai is renowned for its in depth study of the applications of kata. STEP OUT OF THE COMFORT ZONE! Come along and give it a go! First class FREE for beginners. Ideal for all ages, men women & children.